The Auto Recloser consists of Pole Top unit & Control unit. 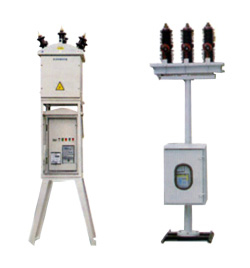 The Pole top unit consists of breaker with magnetic actuator, PT and CT / current sensors. Control unit consists of metering equipment, control accessories and protective relay timer units. The control unit is mounted either on the pole or on the mounting frame. So that it is suitable to operate from the ground level. Both recloser and control unit are linked by cable. Based on system coordination characteristic of reclose time interval and relay time are selected. After completing selected number of reclosing the system goes to permanent lockout. If the fault is cleared earlier the relay resets automatically after reset time. Recloser gets power supply from the high voltage incoming line itself through potential transformers. Number of reclosing is selectable upto maximum of three. The capacity consists from 12Kv to 36Kv.